I come to you with an urgent plea for prayer this morning, my friends. 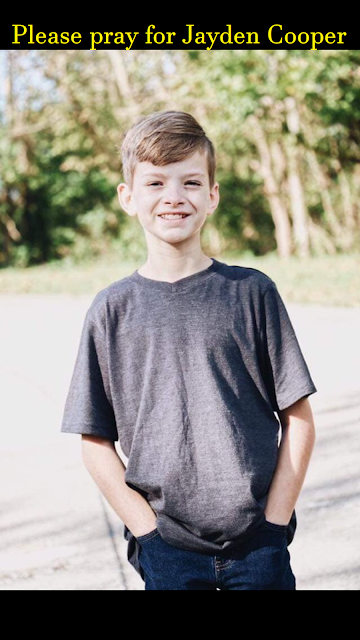 12-Year Old Jayden Cooper is in the hospital, very sick. 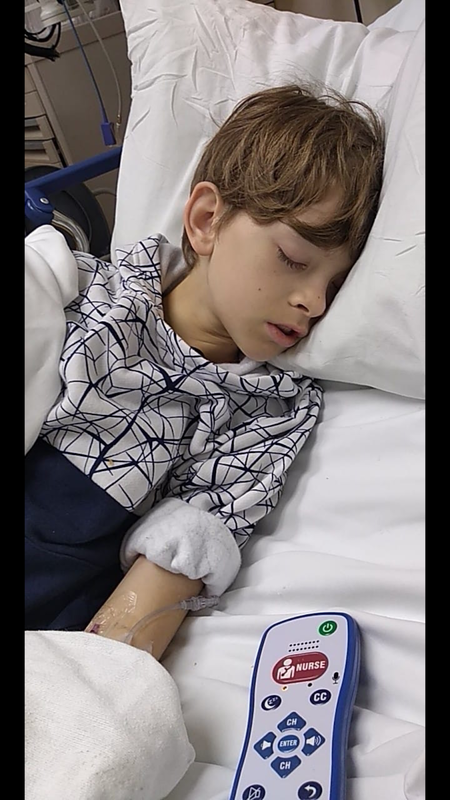 After suffering with severe abdominal pain and some vomiting over the past few weeks, the vomiting became worse, and he was hospitalized for testing. He has lost weight, his heart rate is elevated, he is anemic, and he is suffering from severe malnutrition. The doctors are still not exactly sure about what is going on, but some possible diagnoses are inflammatory bowel disease and/or Crohn's colitis. His family asks that you please pray for Jayden. Please pass this prayer request along to every prayer warrior you know, and share with your social media and prayer groups, if you will. Your prayers are deeply appreciated! If you have special prayer needs, always feel free to reach out to us by clicking on the "Cheryl" button in the right side bar "About" section, then clicking "Email" on the next screen. God bless each one of you and meet any needs you have today. I am praying for all who will read this post! Seeing a child suffering is so sad. Prayers for this sweet boy. It truly is, my friend. Thank you so much for your prayers! Oh, this is so heartbreaking! Yes, I will pray for Jayden, Cheryl. I'm praying for Jayden and his family. May God give him a quick and full recovery. Amen, brother. Thank you for praying! Praying for Jayden and his family, so heartbreaking! Oh my. I'm so sorry to read this! I lifted Jayden up to the Great Physician and the God of all Comfort. Thank you for your heart, always ready to intercede for those who need the Lord's healing and help. Dear Karen! Thank you ever so much for your kind, precious words of encouragement. You are such a blessing to me! Thank you so much for praying! Praying for little Jayden today! God bless you for sharing Cheryl! Thank you so much for praying and for your kind words, Bettie! I am praying for you, too, and hoping with you that the new meds are working for you, my friend. I will pray for the sweet boy, Jayden, my friend. Thank you for asking! Thank you so much, dear Kitty! Yes Cheryl I'm praying for this young man. Thank you, Bev! I made sure the family read your comment, and they are most grateful to you. I do trust Jesus to completely heal Don and am SO thankful to hear he is doing so well! Your prayers, concern, and sharing are so appreciated! Oh, Cindy! What a precious, anointed, heartfelt prayer! Thank you so much, my friend! I will pray for this precious child, to recover and walk in health. That this test will soon be a testimony to Gods miracles, healing power, grace and Love. Thank you so much, Tonita! Oh, Elaine! It truly is so very sad. Thank you so much for your kind words and loving support. Your words touched my heart very deeply. Love you and appreciate you, my friend. Praying for this sweet boy, what a scary thing to go through!!!! Any update on how he is doing? Praying that he is doing better, and keeping him and his family in prayer!!!! Yes, sweet friend, I was just finally able to do an update. I was waiting until he could hold down the liquid and have the test, so I could include the diagnosis. Your prayers are so appreciated! Thank you, dear Shaz! You are so faithful to pray and are such a blessing! God’s healing power be upon him!